Wednesday's thousand meter pieces were good, but not spectacular. My steering was definitely less than stellar, as evidenced by the GPS map of my course. A little hard to see, but most noticeably: not a lot of straight lines. Still, it was great to get out on the water and do some pieces against other boats. 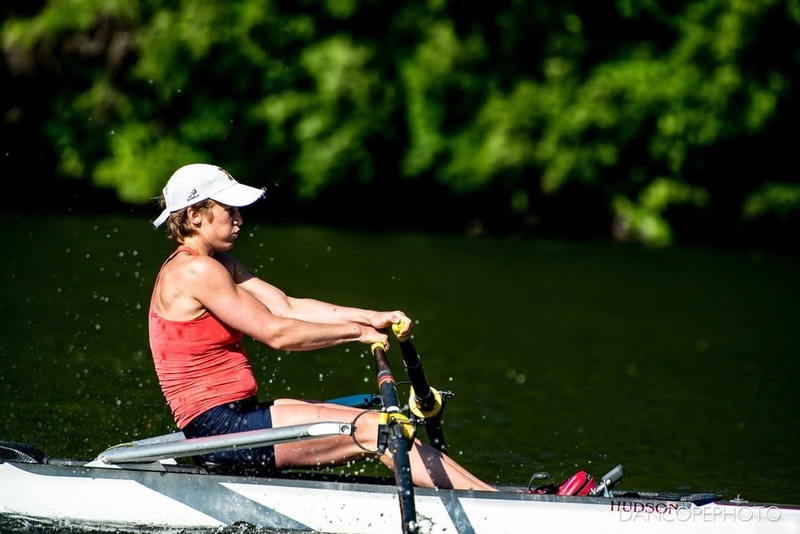 I was racing against a few junior women's openweight singles; the world record times for that category are fairly comparable to senior lightweight women, so we had some good racing. In the afternoon, we headed back out on the water to start doing some race prep and speed work. Although I was tired, it was great to have the extra meters on the water practicing race-specific skills. We did even more of it this morning, but slowed things down even more to make sure we knew exactly how to execute a proper start sequence. I'm still working on getting the stroke rate over 42 on a start, but it will come with practice. In the meantime, it's laundry day! At home, I do laundry and grocery shop on a rolling basis, so I never really have a sense of how much dirty clothing I produce or how much food I eat. This week, it's become apparent. I've gotten a bit lax about wearing clean clothing to train in. Sometimes, it's not necessary or practical. Still, the cold weather means I've been wearing two layers on bottom and three on top for most sessions. Even if I rewear one layer on top and bottom per workout, with two workouts a day, that's a lot of laundry. Fortunately, there's a washer and dryer on site, so clean clothes are on the way! Food has also been a bit of a shock. I've already plugged through most of a jar of peanut butter, a loaf of bread, two cans of beans, a box of pasta (plus sauce), two pounds of frozen spinach, two pounds of baby carrots, a box of frozen squash puree, a bag of frozen peas, a head of lettuce, a can of beets, a big tub of hummus, a box of Nature Valley bars, three pears, 6 bananas, 5+ apples, a quart of almond milk, half a box of Grape Nuts, half a (big) box of raisins, a can of soup and more. It's been four days. Please don't calculate how many calories that is. The chances that I'll need to go grocery shopping again before I head to Princeton are high.. right after I bought all my groceries? I was worried I'd have food left at the end of my two week trip. Apparently my stomach is bigger than my eyes. I'll touch on this more soon, but I've been trying to listen to my body when eating. I think there's a reason we go through so much peanut butter--I'm just really hungry all the time and peanut butter has a lot of calories. Hopefully that's a lesson I can carry back to California.